Happy Friday! You wouldn’t have known it because it didn’t affect front end access, but I had a major website issue for most of this past week that prevented me from posting or editing anything on my site. Between constant emails with different tech people and many heart palpitations, I spent more time in the kitchen than usual. I’m always developing and testing recipes, but I did a LOT of new stuff. It was a good excuse, as the produce lately has been outrageously perfect. Summer never fails to deliver in that respect. 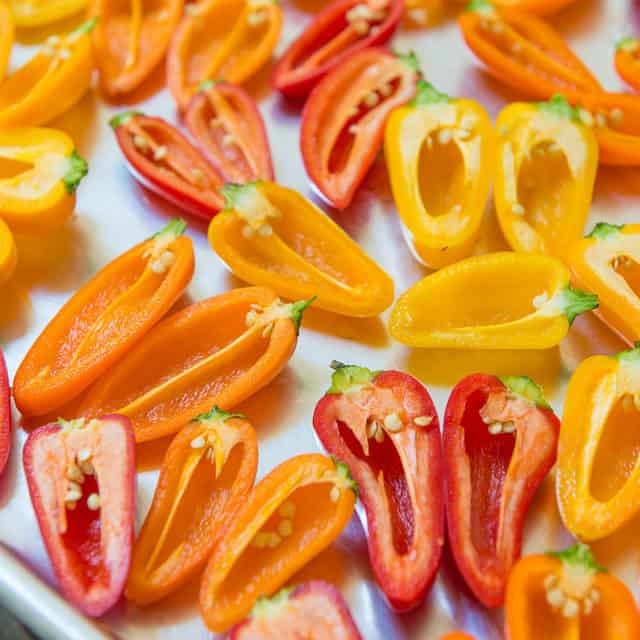 How perfectly colorful and crisp do these mini peppers look?! The funny thing about my website emergency is that before I started this site, I never had any idea of how much tech upkeep and work goes into running one. And I’m purely talking about the coding and backend stuff, not any of the actual cooking or photography. I hire a web guy (hi Andrew!) on retainer to take care of the site because things are always changing, and stuff is going to break. I’m just glad that things are working again without issue. The silver lining from this is that I’ll be switching over soon to a new recipe card system, that will be even better than my current one. The nutritional information should be more accurate as well. I’ve got 800 recipes to convert, so it will take a little time, but a big goal of mine for 2018 was to make a lot of website improvements, and this is aligned with that goal. A great list of the best quality, affordable olive oils. This is a very interesting looking salad. Even as a semi-ungrateful teenager traveling to St. Petersburg with her dad, I was blown away. The architecture is incredible. I’ll keep my eye out. I have a hard time spending a lot on flowers and these look nice! Some would say this is sacrilege, but after months of experimenting with low carb and keto and observing the effects, I’m on board with continuing to limit my intake. Hospital food really is the worst ever. I always wondered how the Michelin guide was funded. Wasn’t expecting this! Good tips for bringing kids when going out to eat. I’ve never seen a tiramisu like this before! I’ve gotten a lot better, but I used to be guilty of a lot of these. “I’ve had a lot of worries in my life, most of which never happened.” ~Mark Twain. Yup.